Obviously I'm pleased that Paul Smith is still finding the time to pop down from Carnaby Street to sign Amelie's swimming certificates, but the fact is that Lisa e-mailed him months ago to tell him he was spelling her name wrong, and it's clearly made no difference. If things carry on like this, we'll be able to use her old swimming bag after all. But still, the good thing is that she's making remarkable progress. Back in August, she could swim eight metres without armbands on her front, and eight metres with ¼ armbands on her back. 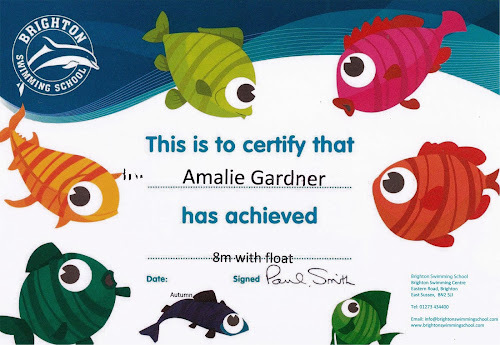 Now she can swim eight metres with a float. Give it another three months and she'll be doing a width on a lilo. Unfortunately, although they say swimming is good for you, it appears to have finished me off completely. I've felt quite ill today, and whilst it's true that I spent a lot of time yesterday eating out-of-date cheesecake, I prefer to blame my sickness on the hour I spent at poolside. I think I've got trench foot and cholera. As if a parents' evening wasn't enough, Amelie had her first school disco yesterday. Lisa's Mum had been visiting for the day too, so having returned home from work, I had just enough time to give my mother-in-law a lift home, before heading up to the school to find my daughter performing Gangnam Style, and attempt to drag her off the dance floor and down to her swimming lesson. Personally, by the end of a working week, I barely have enough energy to lift expired dairy products out of the fridge, but despite doing a full week at school, Amelie came bouncing out of the hall after an hour's rave, and happily accompanied me down the hill for some more physical exercise. She told me there are two 'E's in lemonade, and at that disco, I think she meant it literally. Unfortunately, once at the Brighton Swimming Centre, Amelie insisted that I spend the lesson on a bench at poolside, rather than up in the viewing gallery, which to me is a bit like sitting in the Rainforest Biome at the Eden Project. I found the heat and humidity oppressive, and by time we left, I was gasping for air. As was Am, after jumping off the diving board. I woke up at 6:15am with a splitting headache, possibly because the kids were already up, but as the morning went on, my headache got worse, and I've been feeling sick all day. Which was a bit inconvenient, as I'd promised Am we could put up the Christmas tree, and she's a bit like the Mafia when it comes to broken agreements. Somehow we managed it, although with Toby constantly pulling down the baubles, it was a bit like painting the Forth Bridge, and I had to go to bed for an hour afterwards. To add to our troubles, Chloe's been acting oddly today, and has been staggering around the flat in a daze, as though she doesn't know where she is. And she hasn't even been swimming. So that's a bit of a worry. As things stand right now, Lisa's the most lucid member of the family, which is a measure of how bad things are. Sounds like we should be thankful to get a blog out of you - even if it's only to get some sympathy. You DID have that flu jab, didn't you? 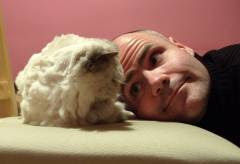 As for Chloe, only this afternoon I was discussing her longevity with another family member. She can't give up now.